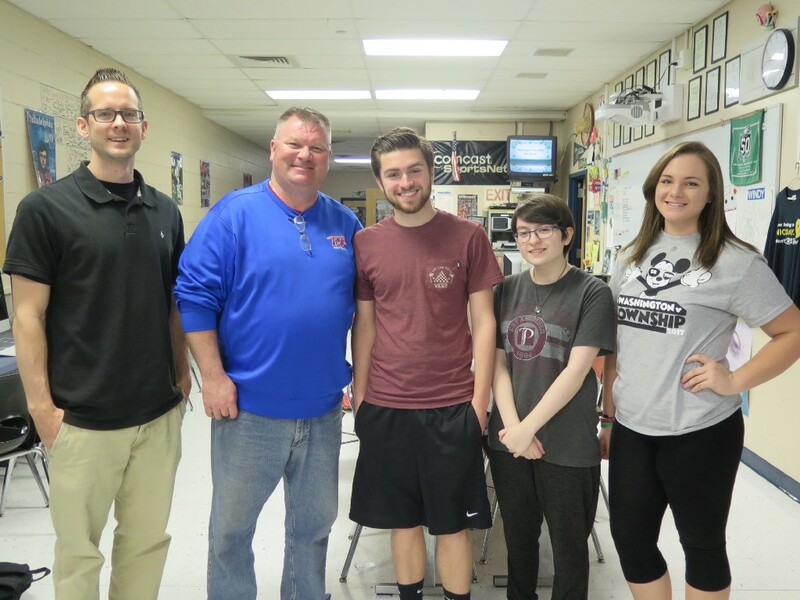 Washington Township High School graphic design teacher Dale Biebel (left) and Washington Township Youth Football Commissioner Mark Colligan recognized Brandon Bittner, Maria Iannone and Tara Oster for their winning designs. A committee representing Washington Township Youth Football has selected three winning designs for a logo commemorating the organization’s 50th anniversary. The contest was open to Washington Township High School students in graphic design teacher Dale Biebel’s classes. The winning designs will be featured during the upcoming milestone season. “We are grateful that WTYF gave our students an opportunity to have real-world experience and the chance to showcase their talent,” WTHS principal Ann Moore said. WTHS junior Brandon Bittner submitted the overall winning design, earning a $200 gift card. His logo will be featured on the 2017 game jerseys. Senior Tara Oster’s design will be featured on the WTYF gala booklet cover. Junior Maria Iannone’s design will appear on t-shirts that will be given to all participants and coaches. Both Oster and Iannone received $50 gift cards. WTYF also presented nine $20 Wawa gift cards to be raffled off to the remaining student-designers. All of the designs were crafted on the school’s iMac computers over a span of five class periods using Adobe Photoshop. The logos will be high-resolution documents that can be saved in a variety of formats.